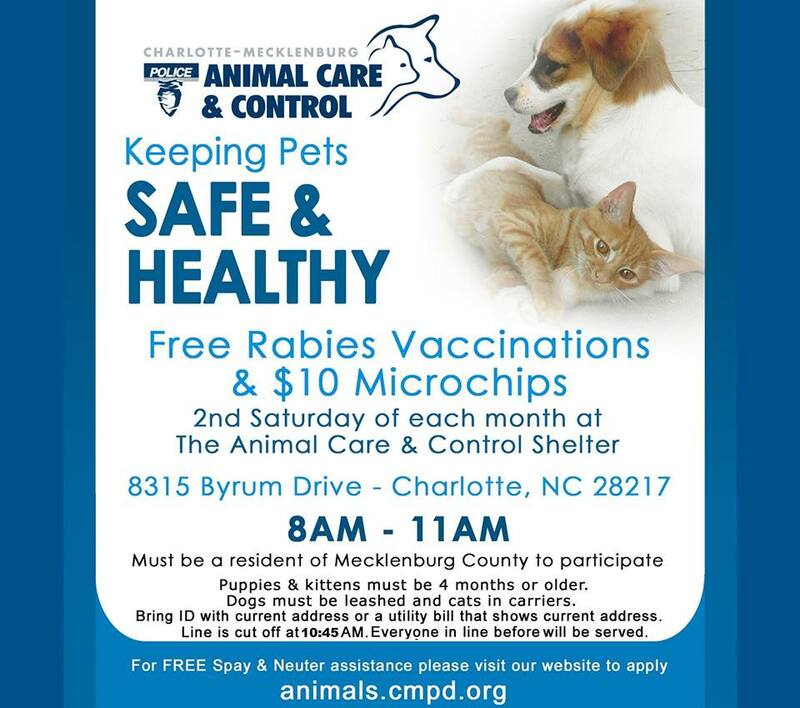 Did you know that the City of Charlotte offers a Free Rabies Vaccine Clinic each month? It occurs on the 2nd Saturday of each month at the Animal Care and Control Shelter located at 8315 Byrum Drive. You can also get $10 microchips! I was out walking 2 doggies and a CMPD Animal Care and Control officer reminded me about this great service. I’ve used the clinic before with Chloe when we first moved to Charlotte. I recommend getting there before the start time because a lot of people show up for this event. We had an overall great experience. Click the flyer above or here for more information on this event and comment below to tell us how it went! Don’t forget to share! This entry was posted in Blog and tagged 311, Animal Control, cats, Char Meck, Charlotte, dogs, kitten care, low cost, microchip, NC, North Carolina, preventative, puppy care, Rabies Vaccine, vet clinic, veterinary care. Bookmark the permalink.